Bone marrow is one of humanity’s first super foods, eaten by our early ancestors and full of protein, calcium, phosphate and magnesium. 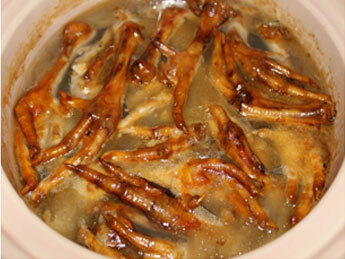 Chicken’s feet are used as a tasty way to cure what ails you.In China chicken’s feet are served up deep fried, in soups, dim sum and stews, and are available seasoned and packaged as a snack. In fact, chicken meat (specifically the feet and internal organs) is in such high demand that it is often smuggled into the country. Not only is China the world’s foremost destination for chicken’s feet but last year (2016) the price of a kilo of chicken feet was more than for breast. 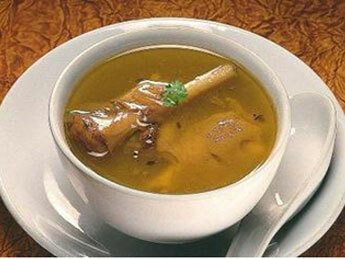 Like most of Jamaica’s signature dishes, cow foot stew was created during the days of slavery. The consumption of feet in the Caribbean was widespread during the 1600s, when plantation owners would take the “best” parts of an animal for themselves and leave the fifth quarter – head, feet, tail, internal organs and skin – for the slaves. These cuts have less flesh and more bone than other parts of the animal, but within the marrow is where the flavour lies – as many cooks know, there’s a richness and depth that only bones can bring to a dish. When I need comfort food there’s nothing that beats AM1NAH’s Liquid Gold Bone Broth PiIi-Pili Beef Oxtail& Cow Foot – the gelatinous feet cooked with herbs and spices can be sipped alone or served up with butter beans, rice and peas (I like to pile on mashed potatoes too). If there was ever a dish that represents Jamaican history, class and culture, it would be cow foot stew. To cook a truly scrumptious cow foot stew you need all the right ingredients, including AM1NAH’s Liquid Gold Bone BrothPili-Pili Beef Oxtail & Cow Foot, AM1NAH’s RAWGANIC Scotty Bon Chilli Oil and pimento seeds, to provide its very distinctive flavour. View our seasonal recipes section for “Comforting Cow Foot” Stew. AM1NAH’s Liquid Gold Bone BrothSIRI PAYA DETOX recipe is coming soon: Using goat’s head as well as trotters, the broth is considered to be a cure for cold, said to improve strength and (you’ve guessed it) act as an aphrodisiac so be sure to add it to your monthly subscription!